At some point during the month of January, a work pal or loved one will attempt to talk you into some kind of cleanse or colonic, making pinkie-promises about how it'll "detox" your guts. Do not listen. It is pseudoscientific marketing nonsense. 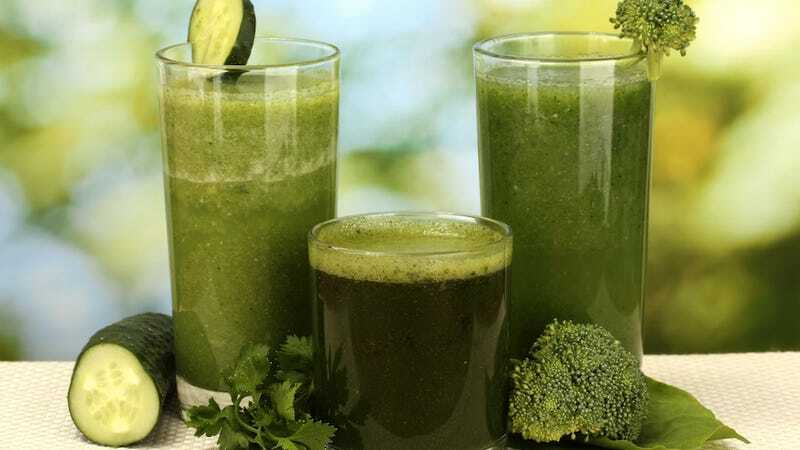 "Let's be clear," says Edzard Ernst, emeritus professor of complementary medicine at Exeter University, "there are two types of detox: one is respectable and the other isn't." The respectable one, he says, is the medical treatment of people with life-threatening drug addictions. "The other is the word being hijacked by entrepreneurs, quacks and charlatans to sell a bogus treatment that allegedly detoxifies your body of toxins you're supposed to have accumulated." "It's definitely good to have non-alcohol days as part of your lifestyle," says Catherine Collins, an NHS dietitian at St George's Hospital. "It'll probably give you a chance to reassess your drinking habits if you're drinking too much. But the idea that your liver somehow needs to be 'cleansed' is ridiculous." "The ultimate lifestyle 'detox' is not smoking, exercising and enjoying a healthy balanced diet like the Mediterranean diet," she added. Sure, if you swear off Jack Daniels and spend two weeks eating celery and cucumbers instead of donuts, you'll probably feel better. But that's because vegetables are better for you, not because you're "detoxing" anything. So save your money and eat some salmon and go for a walk and call it a day.